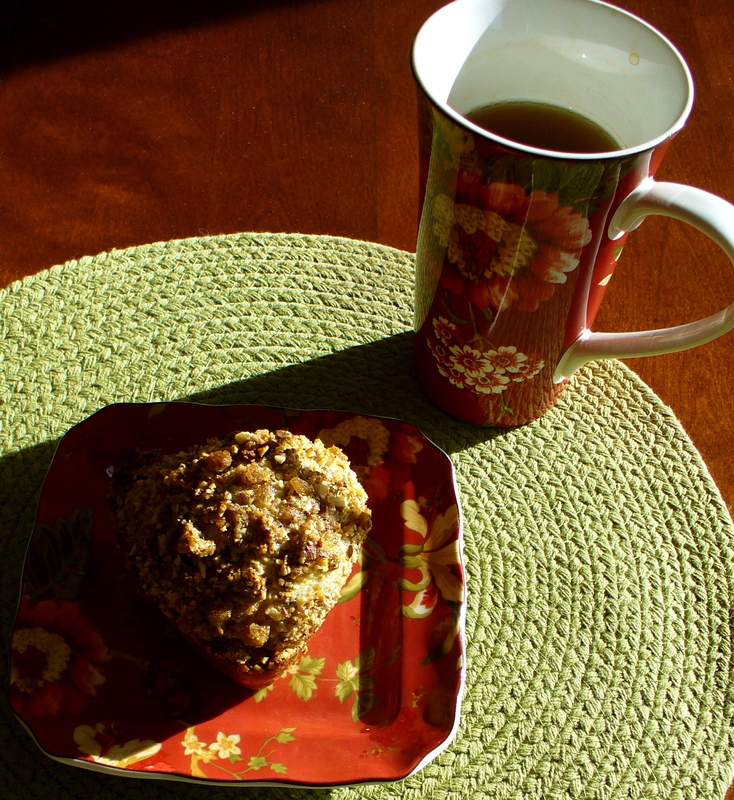 Read about a simple way to augment a muffin or other mix. Joyful Hermit swooped up several half-priced blueberry and banana nut muffin mixes awhile back. On their own merit, they offer minimal protein (2 g) per serving. But augmented, the food value places these delights in the healthy breakfast ballpark. The blueberry mix found calls for 1 c. water, 3 Tbsp. oil and 1 egg. Joyful used 1 1/4+ cups buttermilk and 2 large eggs (3 if small). That boosts the overall protein to 12 grams plus adds 16% potassium, 35% vitamin D, 48% calcium, and 14% vitamin A. An additional egg adds 6 g. protein. But before adding the buttermilk and eggs, JH adds 2 Tbsp. ground flax seeds, 3 g. protein plus good for heart health. One Tbsp. soy lecithin granules contains microcholines for heart and brain health, plus aids in the rising and texture of the muffins or breakfast cake. 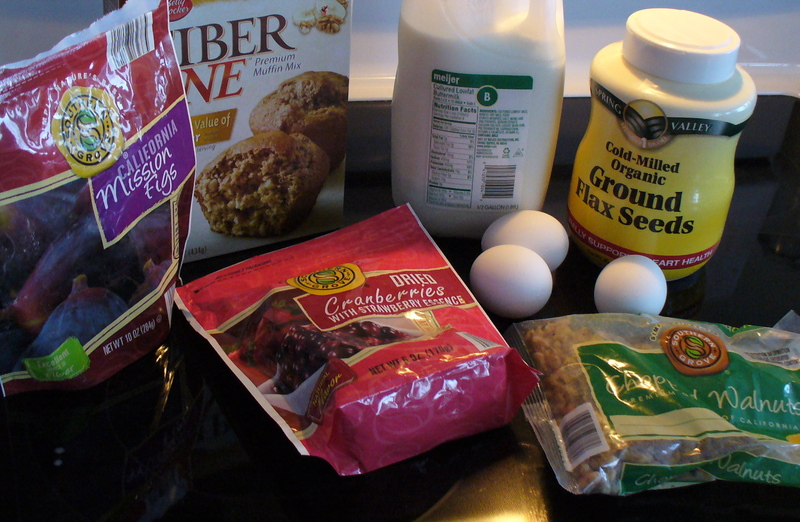 Dried cranberries and figs–or whatever dried fruits found on sale or clearance and stockpiled in the pantry–can be stirred into the dry muffin mix before the eggs and buttermilk. One-fourth cup dried cranberries adds 24% vitamin C. The same amount in figs, chopped, gives potassium and 6% iron, plus great fiber. 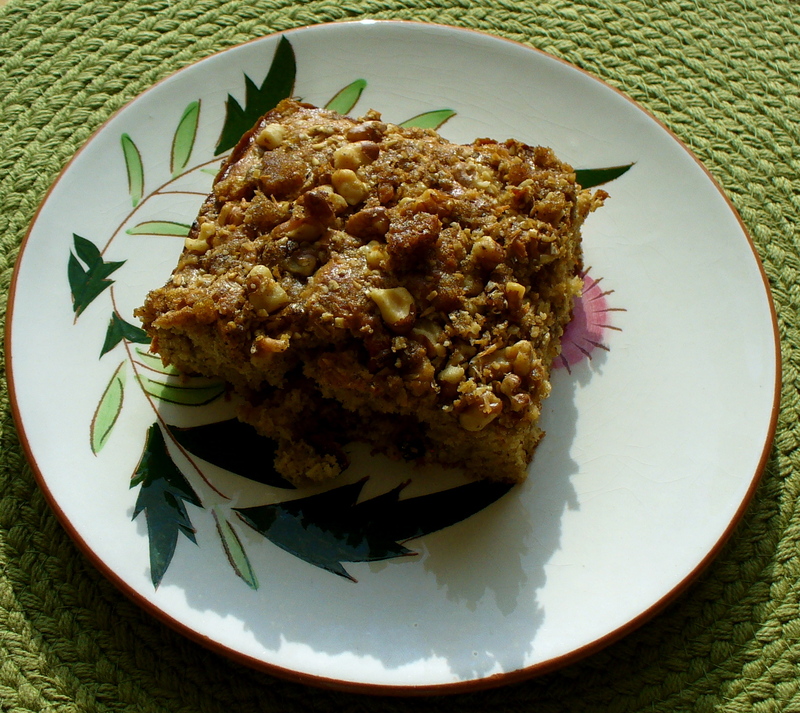 When all is hand-mixed to just moist, add some nuts either in the batter or use for a topping. Walnuts–1/4 cup–provide phosphorous, copper, manganese, magnesium and 5 g. protein. Joyful uses 1/2 cup. The good kind of fat in nuts help with moisturizing effect. Scrape the bowl of batter into buttered 9×9″ pan or muffin tins. JH mixes the topping ingredients right in the bowl used for the augmented mix. The remnants of batter bind with 1/4 c. or so brown sugar, 2 Tbsp. butter chopped in bits, 1/4 c. quick-cook steel cut or rolled oats (steel cut adds 5 g. protein), 1/2 c. chopped walnuts, almonds or pecans, and 1-2 tsp. spices of your choosing. Joyful experiments with cinnamon, ginger, cardamon, nutmeg, allspice, cloves, mace or combination depending upon the mix flavor. Combine topping ingredients until crumbly, and sprinkle on top of batter. Bake per mix instruction. JH lowers oven heat 30 degrees or more depending upon using 9×9″ pan or muffin tins, and lowers a little more if dark coated pans, with less bake time for dark pans. Be watchful! Done when firm to touch. For a little joyful augmentation, a basic muffin mix can provide per ample serving (1/6 total amount) 6 grams protein, up from the original .33 grams (2 g÷6). The calcium, vitamins D, C and A, phosphorus, iron, manganese, magnesium, copper and iron pump up impressively from mostly nil if using the box mix as directed. Even if the serving is 1/9 of the sum (square pan cut in 9 pieces), the protein is 4 g. per serving; and the other nutrients pull a dramatic increase. Joyfully Augmented Breakfast Cake (or muffin) is deliciously healthy compared to what would have been a high-carb, don’t-bother breakfast. No, Joyful Hermit does not figure out nutrients to such a degree with every meal but has learned to read and compare protein and major vitamins when selecting items. JH always magnifies the base product to boost protein and nutrients for little cost and effort. The same mix, for example, can be altered by dried fruits, nuts and spices, providing seasonal variety and delighting guests who happen by the hermitage.